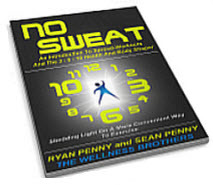 Since Sean and I wrote NO SWEAT back in 2012, the evidence to support what we presented then has multiplied massively. What we originally set out to do was smash the notion that only long workouts benefit health and body shape. Instead, we made a case for what we called Spread-Workouts. A Spread-Workout is a way of accumulating exercise in short, manageable sets through the day. It provides a genuine solution for people of all ages missing out on the benefits of exercise because of time, money, and location obstacles. The reality is that sedentary living and a lack of regular exercise is unhealthy. That's why the basic message in the book, which is so simple, is so important: - You can do the kind of physical activity needed for a healthier, happier, and longer life more easily than you think. You just need to think, NO SWEAT. "A clear and well-­written, dynamic take on what it means to be fit and how to get there."